Las Vegas is one of the fastest growing cities in the country. Dale Devitt knows what this means for the arid region’s water use. Water conservation is a top priority and Devitt plays an instrumental role in addressing Clark County’s water management issues. As a professor of soil and water sciences in the department of Environmental and Resource Sciences, and state specialist with the University of Nevada Cooperative Extension, Devitt has spent 19 years in Las Vegas building partnerships between the University and the community to address efficient and sensible water use. Devitt says water availability must be balanced with economic growth. Part of his research—Devitt’s research portfolio is worth about $400,000 annually—is looking at the long-term effects of golf course irrigation with reuse water instead of using municipal water. Although golf course irrigation accounts for about 9 percent of the valley’s total water use, the golf industry brings in over 250 million dollars annually (money associated with golf play only) to the Las Vegas economy. Treated effluent can supplement clean water use. It’s a win-win for ClarkCounty. Devitt’s research confirms that the treated effluent is a better management solution for large fields of green. He uncovered a caveat, however. Golf course foliage—trees, shrubs and groundcover—was visibly damaged by the treated water, causing economic losses as course managers had to replace plants. Not swayed, he developed another study. At the Center for Urban Water Conservation, a 10-acre site in North Las Vegas which Devitt directs, he is testing which plant species aren’t damaged by effluent from sprinklers. A list of plants that are less prone to damage has been created, but Devitt is expanding it. Devitt’s research extends from water management issues in specific settings to broader outreach programs. Other extension educators regularly partner with Devitt, and together they form an alliance to look at Las Vegas’ water issues from a variety of lenses. At the Center for Urban Water Conservation, for example, a fruit orchard was grown to become a self sustaining program where community growers manage the orchard and sell the fruit annually. Community gardeners gain experience testing and growing different fruit varieties and sales maintain the program’s long term vision of supporting urban agriculture, learning and smart water use. “Research and educational programs need to be developed that focus on all areas of water usage,” Devitt says. “This includes programs aimed at improving irrigation efficiency in urban agriculture,” like what his Center is providing. 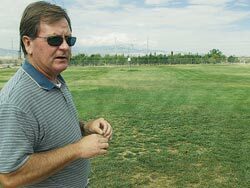 When giving a tour of the Center, its research plots and its remaining acres that will soon be used for new research, Devitt mentions that it is the growing populace in Clark County that is driving the water use. He says that a smarter, clearer vision, one that incorporates all sectors of water use, is needed to manage the resource for the future.